Yesterday was incredible. But it didn’t start out that way. It had rained the night before, making the morning commute terrible, as the roads were still wet and covered with heavy fog - traffic was bumper-to-bumper all the way in. Wednesday’s at the office are always slow, coming off the two day rush from the weekend auctions, so that adds to mundane nature. Thursdays is a weekly auction night for us, so we spend the whole day gearing up for that. Fridays are always insane, as we make sure everything is ready to go for our Sunday auctions. So, Wednesday is just that day in the middle that no one likes, it's just kinda "blah", and yesterday started out no different. After a few hours of grinding through paper work, just all of a sudden, the tides started to turn! The weather started to clear up (I think it hit 50 degrees! ), we were ready to order lunch, and the mail had just arrived. That very moment, when we all saw the postman lugging in those packages, was when the day went from being "blah" to being awesome. We received the two vintage card collections that we've been waiting for! And wouldn't ya know, about a half hour later, we got confirmation that we'd have an "in-office" appraisal later in the day as well! We’ve never had a Wednesday like that. Heck, we haven’t had ANY day like that in recent memory. We usually purchase four, maybe five collections a week, whether it’s through the mail or by appointment. It’s been pretty consistent like that for a while now, but yesterday was different. We actually got in three awesome collections... and we bought all three! Hat trick! 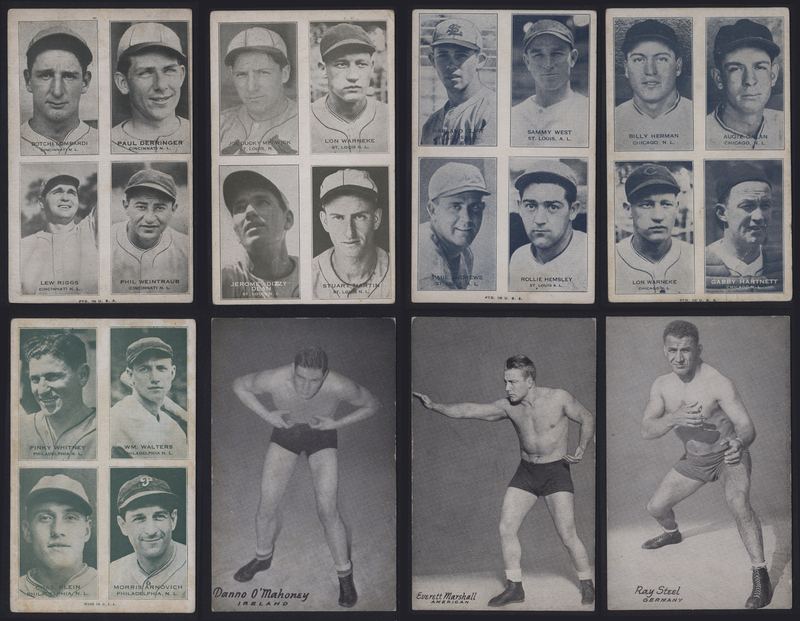 The first collection was rather large and consisted of a nice run of sets, the second collection was extremely small but rare, and the third was a collection of stars and rookies, varying in condition. Surprisingly enough, the largest collection, which consisted of (16) complete sets, was not our in-office appointment yesterday – we received this collection through the mail! The gentlemen actually lived too far away to make the trip down from Upstate NY, so he just shipped it to us. The woman who sold us this small collection said she actually found these cards just sitting in a drawer! What a find! We are so glad she took the time to contact us about her collection. The condition for all the sets were again, “collector grade” – which is expected when you assemble sets card by card. 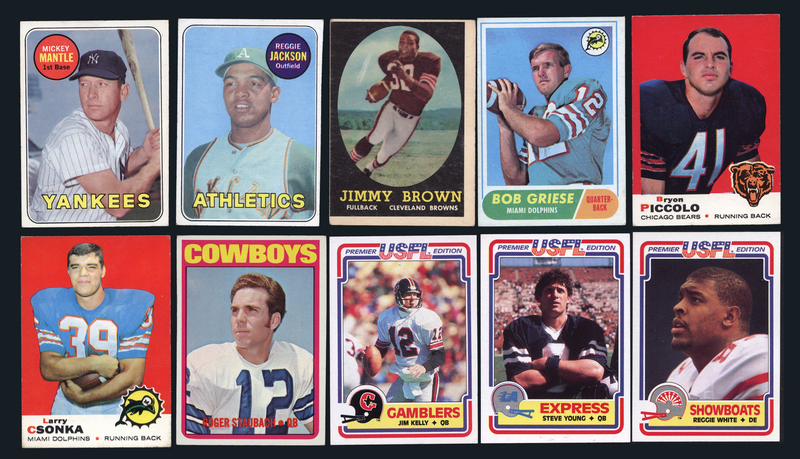 But, they did include most of the key rookies from the post-war era, including a 1958 Topps Jim Brown, 1968 Topps Bob Griese, ’69 Topps Piccolo & Csonka, 1972 Topps Roger Staubach, 1984 USFL Jim Kelly, Steve Young & Reggie White, along with a few Jerry Rice rookies from 1986 Topps. Also included in the collection was a single baseball set from 1969, which included a Reggie Jackson rookie and a nice Mickey Mantle! Ok, the day had already gone pretty well so far. We just purchased two great collections, the weather had finally turned, and we eclipsed the half way point of the week. Then, the doorbell rang – and the day got even better. We had an appointment set up with a gentleman from Pennsylvania, who had finally arrived. He dropped his wife and kid off down the street to get a bite to eat, then brought his collection of a few thousand cards in to be appraised. After going through the collection with our head specialist for about an hour, the appraisal was finished and we made him an aggressive offer. It took him all of about two minutes to accept, and he and his family couldn't have been happier. It was an unprecedented Wednesday, and in no way am I complaining! I wish everyday could be like that for us! You can watch a recap video of the collections below. Do you have a collection of sports cards you’d like to sell? Well don’t wait any longer! Contact us today to set up an appointment to get your collection appraised. We are open Monday through Friday with normal business hours, and in some cases, we will even travel to you!